Do you find your morning ritual of chewing cereal dull? Do you wish you had time to squeeze in a workout in the morning without actually having to sweat and spend any energy? Well the answer is here with the Breakfast of Champions Spoon! This novelty spoon has been shaped to resemble a muscled arm clutching a dumbbell. 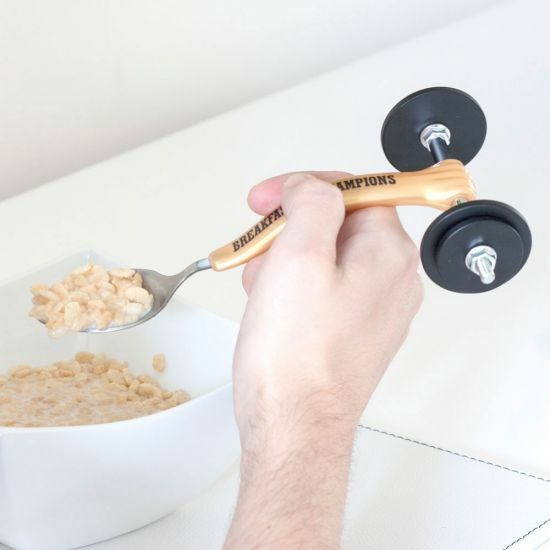 With every trip of the spoon from cereal bowl to your mouth you can content yourself in the knowledge that you’re working out and it fits in perfectly with your morning routine. This novelty spoon would make a great stocking filler or gift for an office colleague. Alternatively you can grab yourself one and be well on the way to muscular triceps and biceps in no time at all! This product is made from: resin; carbon steel with black painting; and SS wire.